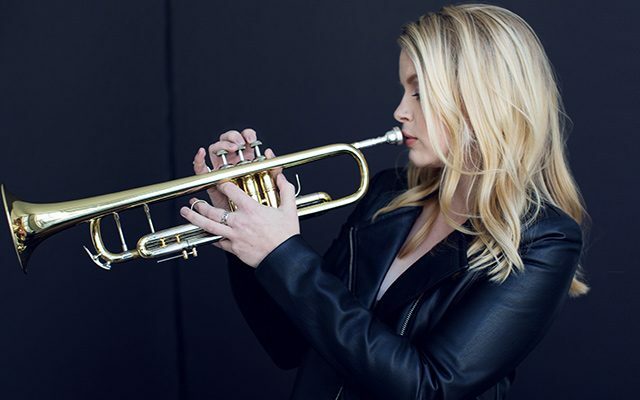 Canadian singer, trumpeter and songwriter Bria Skonberg is described by The Wall Street Journal as one of the “most versatile and imposing musicians of her generation.” Recognized as one of “25 for the Future” by DownBeat magazine (Summer 2016), Skonberg is newly signed to Sony Music Masterworks’ OKeh Records, and released her debut LP titled BRIA in September 2016. Wielding a unique blend of modern-day pop sensibility and sizzling musicianship, Skonberg aims for a sense of allure on the new collection. She credits producer Matt Pierson with helping her create music that is both curious and exotic, playing with tension and storytelling. Elite jazz chops, artfully mixed with worldly rhythms and contemporary songwriting, result in a sophisticated pop sound closely resembling that of Michael Bublé, Diana Krall and Harry Connick Jr. Bria’s original tunes include the tango “Curious Game,” the bluesy instrumental “Down in the Deep,” and the Brazilian-flavored “How Can It Be” – a reflection of the sampling era.